MORGAN HILL, CA (BRAIN)—Specialized is offering consumers a special deal during this year's Tour de France: buy a qualifying Specialized road bike or mountain bike at a participating Specialized dealer, and earn up to $400 in free equipment. BOULDER, CO (BRAIN)—The Selling Cycling web- and DVD-based staff training program recently set a new record by surpassing its 300,000th training incident for the 2008 season, according to Ray Keener, Growth Cycle President. The success is the result of several factors, Keener said. SUN VALLEY, ID (BRAIN)—Scott USA employees are preparing to move into a new building the first week of July. Just a short walk down the street from its current office, the new U.S. headquarters offers three times the space and a host of amenities. ROCKY RIVER, OH (BRAIN)—Century Cycles has been honored by Smart Business magazine with a World Class Customer Service Award, which is bestowed upon Cleveland-area companies for their superior customer service. SPEEDWAY, IN (BRAIN)—Don Walker becomes one of the latest entrants to the IBD retail market, with a new store specializing in a wide range of handmade bicycles, Speedway Handmade Bicycle Works, which has its opening party on June 28. WAUCONDA, IL (BRAIN)—Javelin, maker of Javelin Bicycles and Zero Components and Schmolke Carbon components, will be relocating (July 1) its headquarters to a larger custom build facility in Lake Zurich, Illinois. PORTLAND, OR (BRAIN)—Showers Pass, known for its wind and waterproof cycling garments, recently consolidated product development and warehousing under one roof. The company has moved into a 6,000-square-foot building just outside of downtown Portland. LOUISVILLE, CO (BRAIN)—Pearl Izumi has begun operations from its new U.S. headquarters located in Louisville, Colorado. Louisville is located in Boulder County where Pearl Izumi was launched in the U.S. 27 years ago. Previously, Pearl Izumi was located about five miles away in Broomfield. PHOENIX, AZ—For nine years Arizona’s Slippery Pig Bike Shop has been hosting night mountain bike rides, with much of its longevity and success owed to the climate it calls home. “It gets busier as the temperatures rise,” said Eric Angermeier, owner of Slippery Pig in Phoenix. Selling Cycling 2008: What's Your Edge? BOULDER, CO (BRAIN)—Selling Cycling 2008 consists of 28 three-to-five-minute training modules, available either on DVD or online. 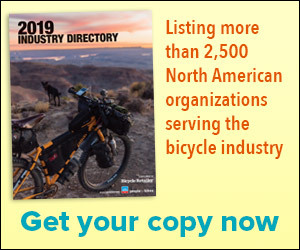 There is also online Product Category training for 32 different bike and accessory categories, and over 4,000 individual product SKUs from 75 top brands. BOUCHERVILLE, Quebec (BRAIN)—Canada's The Cycle Néron Specialized Concept Store opened in late May. It's located at 513 Samuel-de-Champlain Street in Boucherville. HOUSTON, TX—At Houston’s Bicycle World and Fitness, sales processed through the shop’s consumer financing program spiked 100 percent in March and April compared with the first two months of the year, according to owner Chris Holmes. BOULDER, CO (BRAIN)—The Selling Coasting staff training program, extolling the virtues of Shimano's Coasting concept and Coasting bikes from seven manufacturers, went live in early April.